Jared Schutz Polis is an American politician, entrepreneur, and philanthropist. A Democrat, Polis is the member of the United States House of Representatives for Colorado's 2nd congressional district, serving since 2009. He is a former member of the Colorado State Board of Education. Polis is the first openly gay parent in Congress. He consistently ranks as one of the wealthiest members of the United States Congress, with a personal net worth estimated at $387,864,231. Jared Schutz Polis (born May 12, 1975) is an American politician, entrepreneur, and philanthropist. A Democrat, Polis is the member of the United States House of Representatives for Colorado's 2nd congressional district, serving since 2009. He is a former member of the Colorado State Board of Education. 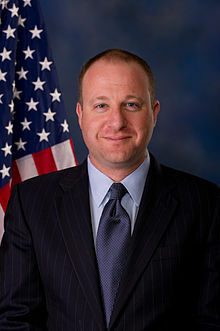 Polis is the first openly gay parent in Congress. He consistently ranks as one of the wealthiest members of the United States Congress, with a personal net worth estimated at $387,864,231. Jared Polis, governor-elect of Colorado, talks about the historic wins for LGBTQ candidates in the 2018 elections, green jobs, and gaming with his kids. CBS News projects Jared Polis will become Colorado's governor, defeating Republican Walker Stapleton.